This week in the world of cartoons, we welcome Ultimate Spider-Man and Transformers: Prime back into the fold. Optimus Prime looks pretty banged up, while Spider-Man takes a trip to Boston to fight New England-themed villains. Adventure Time, Regular Show, and Gravity Falls are off this week, but will return. As always - minor spoilers ahead! Peter Parker takes his talents to Boston to face off against some distinctively New England villains, including Slam Adams. Really. I kinda wish I made that up. I kinda wish Tom Brady was in this episode too. This should be a pretty humorous episode and fresh start for Ultimate Spider-Man after its hiatus, so I’m in. Check out the above clip for animated proof that Boston hates Spidey. Transformers: Prime – "Darkmount, NV"
In the premiere of the third season of Transformers: Prime, the Autobots are left in shambles. 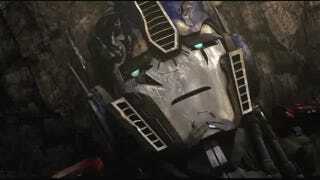 Optimus is a beat up mess, the team is scattered, and the Autobot base is destroyed. We all know Megatron is up to something. Will the Decepticon leader step up and seize this opportunity to end Optimus Prime’s reign? Enjoy this extended clip from the season premiere. Dragons: Riders of Berk – "We Are A Family, Part 2"
Hiccup and his rival Mildew team up in the season finale of Riders of Berk, picking up from last week as Hiccup set out to find Toothless’ home. A second season of Dragons: Riders of Berk is already in the works, with the show setting a new bar by bringing feature-quality animation and voice talent to Cartoon Network. Archer – "Un Chien Tangerine"
Archer and Lana are in Morocco, sleeping in a hotel room Allen Ginsberg wrote literary masterpieces in (allegedly). ISIS is in Tangier looking for a rogue field agent, but they come in contact with a slobbering dog along the way. Archer reveals his hidden love for X-Man Nightcrawler in this clip. Archer clips are possibly NSFW depending on where you work and if you carry ear buds. It's Saturday morning...you can probably risk it. Top image courtesy of the Hub. Dragons: Riders of Berk airs Wednesdays on Cartoon Network. Archer airs Thursday nights on FX, while Ultimate Spider-Man airs Sunday mornings on Disney XD. Transformers: Prime airs Friday nights on The Hub with replays on Saturday.